We fell off the planet (or at least the internet) for a few days! But now we're back! Not much tonight (I'm tired!! ), but I thought I'd share a few pics that are a little better than the ones in our last post! Seriously, she's got some blue eyes. She is one happy girl. If she's in a fussy mood, you know something is up. She may be one happy girl, but she is NOT a good sleeper! She'll put herself to sleep at nap and bedtime, it's just that staying asleep all night that's killing us. She had hit a good spell where she was only waking once a night. That is TOTALLY doable in my book. Any suggestions? Don't give me the "cry it out" method though... This momma's not cut out for that... at least not this year. Oh yeah... some folks had asked for links to see the pics we got done. There are A LOT of pics there. My favorite ones of Izzy are on the last page. There are 2 albums there, Catie's last session and Izzy's first. Both have some really amazing pictures. What happens when you're stuck on the phone w/ a tech guy trying to fix something on your computer (and you can't get off because you know it will take you another 40 minutes to get through again) and your child has... hmmm... intestinal fortitude (as D.D. so aptly worded it)? Do you really want to know? That's what happens. Let me tell you, that was fun to clean up!!! Sometimes I think that about the unique position that Tre' and I find ourselves in as parents. We have friends who are in the same boat and sometimes I wonder if they experience things the same way we do. We've had the experience of having an "only" child twice. I use the word "only" loosely as we are the parents of 2 kiddos (thus far), but we've had each of them alone and without a sibling present. Now, I know, that's obvious. But it's funny sometimes because I wonder if our experiences or feelings are a "2nd kid" thing or a "because we lost Catie" thing. For example, when Izzy was first born, the poor kid must have been called Catie at least half a dozen times a day. I cringed each time I did it because I was so conscious of letting her be her own person, not replacing Catie... (not that either of our kids could ever take the place of the other, but you get what I'm saying). I reminded myself of being called Nikki and John (my brother and sister) or even Murphy or Greta (our 2 dogs -- sorry Mom and Dad) as a kid and worked to reassure myself that this was a "2nd kid" thing, not a "we just lost Catie" thing. There are many times throughout the day that something Izzy does reminds us of Catie. I sometimes stop and wonder, "2nd kid" thing? Whatever the cause, those moments give us pause, a heart squeeze, and usually a smile. *While Izzy was in the tub tonight, I decided to tackle the basket of tub toys that hangs on our bathroom wall. It's hardly been touched since last fall before Catie got her G-tube. It's one of those things that I just hadn't tackled yet. Well, Iz is old enough to enjoy some bathtime fun, so I tossed a few toys in and started sifting through memories. As Izzy played with a bathtime book that Catie loved, and chewed on the nesting cups that Catie used in the tub for nearly 4 years, I sorted dried up bath paint and cracked tub crayons. It reminded me of how much Catie loved it when I would color w/ her while she was in the tub, of how she liked good-smelling stuff (especially foam), and how her favorite bath toy EVER was just an empty bottle of body wash and the top that went on it... There were lots of memories there, and that's hard... But there are lots of memories yet to be made, and that's good. *As I pulled the shower curtain closed I heard the familiar bump of the cup that I have used to rinse my girls heads (let's face it, I can't say rinse their hair =) !!) for over 4 years. I hadn't noticed that particular noise with Iz until tonight and it was one of those weird things that sends you spinning back to another time. Sometimes I hesitate to write here how much we think about Catie. I don't want to give the impression that we're not enjoying Izzy and soaking up every bit of her. We are... Again, we're just in a somewhat unique spot as Mom and Dad. Holding tight to one (even though, truth be told, the process of letting go begins the day they're born) and continuing to learn to let go of the other (while holding tightly to the memories). Plus, it gives me a record... a record of my memory of both girls and of our progress in the grieving process. Plus, it's cheaper than therapy! So did Uncle D do a good job on Catie's video or what? The music is perfect -- all music she liked -- I can still hear her in the backseat singing This is My Father's World, only she said "fadder" instead of "father," so she sounded like she was in the mob or something. =) I honestly don't know how Uncle D got that put together in the amount of time that he did. The stack of pictures that we gave him was INSANE and most had to be scanned in because just before Catie died, my old computer crashed and all my pictures were on it. The first time I watched it, I was simply amazed -- he totally captured Catie in it and I felt like it was an accurate picture of how she lived. The smiles... the hands in paint (or purple sand or flour)... hooked up to chemo in the toddler infusion chairs watching "her show" on the little televisions at the clinic... sound asleep in her hospital bed... dressed up or wearing sunglasses... I remember the circumstances of most every picture there... I may not be able to tell you the date or the month or the year, but I can remember what we were doing. There is one where she is sound asleep in an wagon hooked up to her IV. That night the hospital was really full. We didn't get a room until after 8:00 and there was no bed to put in the room until after 10:30. I love the one where she is in a hospital gown, has on chemo gloves, and her arms are thrown up in the air. She looks so happy in that picture. In spite of all that went on, we really did have some fun at the hospital. There are a couple of Catie, Aunt NikNik, and me... one w/ a nutcracker at a Lighthouse Christmas party and one of the 3 of us touching our noses with our tongues (must be a family trait). I love those 2 pictures. The tongue one was taken as we waited for Catie to go back for her 3rd craniotomy. Immediately after it was taken, Dr. Hudgins walked through the curtain (he had just finished operating on Baby Noor -- remember that?). Catie asked him if he could do that? I remember the funny look on his face as he tried to touch his tongue to his nose... You've got to love a neurosurgeon who will be silly with his patients in between serious surgeries in the depths of children's brains and spinal cords... The ones with the full head of hair get me every time right now... Especially those after we started chemo back b/c I remember just waiting on it to fall out... The video clip in the middle is from her 2nd birthday. We were partying big b/c we didn't get to for her first birthday. She'd just opened her chair from Lisa and Dennis and she was so funny. The chair is the one we take Izzy's picture in each month. This time last year was GREAT... we hit a minor bump w/ something crazy w/ a lymph node in her neck. It had to be removed, but ended up being ok. She was going to preschool and loving it and we were getting ready to go to Disney on her Make-A-Wish trip. We had no idea what was lurking a few weeks away... It was probably the most carefree time we knew... the chemo was easy, she was doing more things like a "normal kid" than ever before.... boy am I thankful for that time. This is the time of year we normally started planning her birthday party, what she wanted the theme to be... 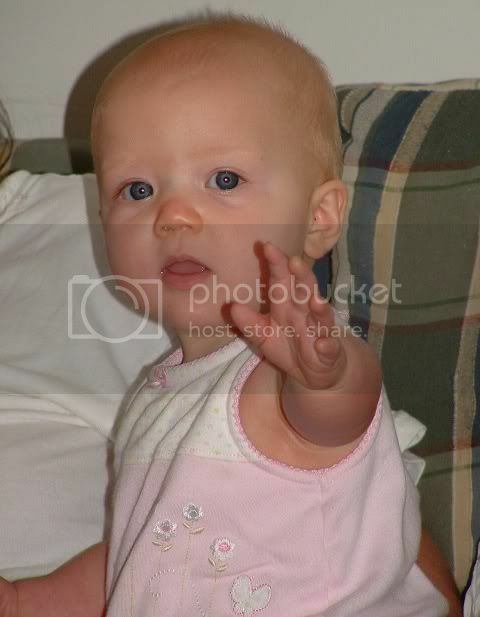 It's hard to fathom that she would have been 5 in 6 weeks. It's still hard to believe she's gone. *the look on Izzy's face when I feed her green beans after she's been eating fruit -- priceless!!!! It has been a pretty quiet around here this week. With the heat, we have stuck close to home for the most part. We've hit the gym and the grocery store, but other than that and swimming a couple of times... not too much. Izzy likes the water as much as her sister did. She hardly quits moving the whole time she's in the pool. She just kicks and kicks and she gets into splashing if she's in the mood. I'm glad she likes the water. It is amazing to me -- in some ways at least -- how many times a day Catie crosses our mind. In the grief books, they talk about your mind adjusting to the loss and trying to figure out where the person that you lost fits now that they're gone. That makes a lot of sense to me and I can see Tre' and I trying to work that out. You want to hold on tight because they're gone... but not so tight that you're not living in and enjoying the present. Lately, in this whole grief thing, I've been wishing for a plan. While Catie was on treatment, there was ALWAYS a plan. You take this medicine every day for 5 days and then you have 23 days off OR you'll go inpatient once a month, 2 days one month, 3 days the next... stay home when counts are low... take this med to prevent this and that med to prevent that.... There was always a plan -- at least until the tumor would throw us off course... but then we always made a new plan. There was comfort (somehow) in the plan because you knew what you had to do... you felt like it gave you some kind of control. Obviously, it didn't give us ANY control, but still, there was comfort in the plan. Sometimes I wish there were a protocol for grief... you know, to let you know what to expect. I must say that it is definitely a learning process. You learn a lot about yourself and how you work and what you need. I still wouldn't mind having a plan though... then too, we would know when to expect the worst of it to be over. This week I was talking with a friend of mine who was there the night that Catie died. We were talking about the overwhelming peace that was present that night and in the days that followed. A fellow mom on this journey has dubbed it "holy novacaine." Pretty clever term I think. That novacaine does begin to wear off, but for the most part, the peace remains (at least for me it has). It's funny how you can feel peace and sadness at the same time. How you can rejoice for Catie and long to see her all at the same time. I know that I posted the words to Steven Curtis Chapman's With Hope on Catie's site, but I'm going to post them again here. They are just dead on... absolutely right. With hope... Doesn't take the sadness, doesn't change the grief, but at least there is hope. During treatment, "hope" was my favorite word. Hope of a cure, hope for a future... I worried that I wouldn't like the word anymore if things didn't go the way I wanted. But, I like it even more now... while death could take away my hope for a cure for Catie, nothing can take away the hope that remains. Nothing... It's nice, after all that's happened, that there's something that can't be destroyed or taken from you in this life. So... hope just might still be my favorite word. Off to visit dreamland. Hope your weekend is good! Ok, you know you want a new pretty bracelet or this fancy tv. Buy a raffle ticket and support a GREAT cause!!! Multiple tickets may be purchased! One Ticket - Two Drawings, Two Chances to Win!!! Thank you God for air-conditioning!!!!! Good gosh it's hot! The heat index here today is like 117-118. That is just insane. We're staying inside and doing as little as possible. This is just a quick post... I've been meaning to put up some links to some of our friends who could really use some extra prayers, and I just haven't done it. So... here goes. Super Ryan is one tough kid who is battling relapsed neuroblastoma. That, in itself, is more than enough for one family to handle, but they've just learned that his mom, Missy, has breast cancer. Ben has recently relapsed with leukemia. His journey has already been long, so this is tough. He's just achieved his 2nd remission and will continue treatment for quite some time. Summer has relapsed AML. She is starting another new chemo this week that will be very tough. I know all of these families would welcome your encouragement and prayers. Your words really do go a long way in helping these families day to day. That's all for now... I just wanted to get those links up. I'll update you on us later -- so long as we don't melt!!!!! Well, I've done it. I've moved to a blog. I guess a brief intro. is in order for those who don't know our story. I'm married to Tre' (whose ability to make me laugh first made me fall in love with him) and I'm the lucky mom of two amazing girls... one who's here with us and one who we lost to cancer at nearly 4 1/2 years of age. Catie, known to her daddy as Midget, was our firstborn. 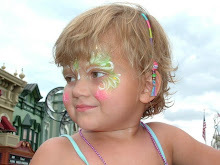 She arrived in late September 2002 at 8 pounds 6 ounces and stretched a full 23 inches long. She was funny and tough, loving and mischievous. God blessed us with her presence, but it wasn't nearly long enough. She battled medulloblastoma, an aggressive brain tumor, from her first birthday till the late January night that we lost her. She had more good days than you could ever imagine and we cling to every memory and laugh and hug she gave us. She waits for us now where she is whole and healthy and we know we will see her again. Enter Izzy, known to her daddy as Moonpie. 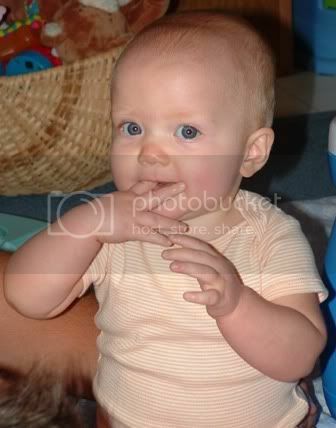 She arrived in late January 2007, just a week after we said goodbye to her sister, at an even 8 pounds and 20 3/4 inches long. How grateful we are for her. She's just over 6 months now and we're thinking she is going to be a bit of a spitfire. She keeps us on our toes and knows how to show us what she wants. 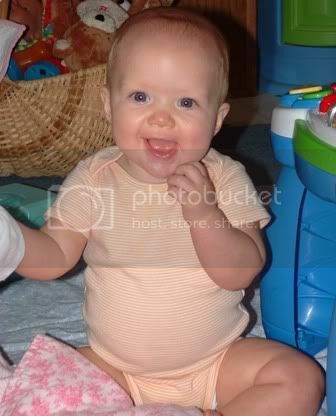 What a joy she is... her laughter has filled our house with music and her squeals delight our hearts. Add Joey, our dog, and I'd say you've met all of us. Through Catie's battle, writing became a huge comfort for me. I've moved here from Caringbridge as it seems a more appropriate venue now that she's gone. Here I'll share Izzy stories (something tells me those are going to get really interesting in a year or so), memories of Catie, and stuff we're learning (or at least trying to) along the way. Hope you'll be back to visit soon.